Open a photo in Guided mode. In the Guided panel, in the Touchups workflow, click Sharpen. The panel changes to display the instructions and options you have for sharpening a photo. Change the view in the Image window. By default, your photo appears in the Image window in a maximized After Only view. 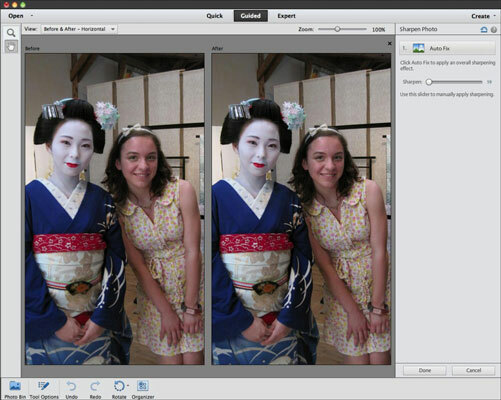 You can view your photo with a before-and-after view where the original photo appears unedited on the left side of the window and the edits you apply appear on the right side. To create a before-and-after effect, click the down arrow where you see After Only in the top-left of the panel. You can also choose a vertical orientation. Click Auto Fix or adjust the Sharpen slider. You have the option of clicking the Auto Fix button, and Elements makes a best-guess adjustment to sharpen the image. To manually sharpen the image, move the slider left and right. Click Done at the bottom of the panel to apply the edits. The advantage you have in using the Guided panel is that Elements offers helpful information to guide you through the edits. 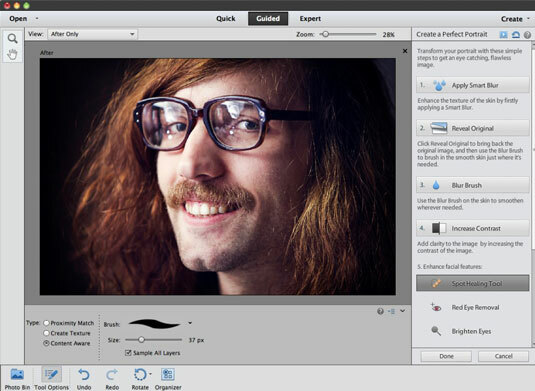 The unique Perfect Portrait edit walks you through numerous steps to enhance your portrait. Start with fixing skin texture, adding clarity by increasing contrast, enhancing facial features by using the healing tools, eliminating red-eye, darkening eyebrows, and whitening teeth. You’ll end by adding a dewy glow and, if you so desire, putting your portrait on a digital diet by using an edit to slim down the person. The process sounds complicated, but just follow the steps with this guided edit, and it’s a no-brainer. You’re sure to end up with a beauty, such as our mustachioed hipster shown. Other commands under the Touchups workflow enable you to perform important tasks, such as fixing flaws (Scratches and Blemishes) to resizing an image without losing vital content (Recompose).